Welcome to the first ever intercultural podcast which has been on the air since 2006 and has won a number of international podcast awards. ‘Absolutely Intercultural’ is its name and it is the longest-running podcast in the world to deal with intercultural issues. We release a new episode every month on the first Friday, looking at all intercultural aspects of human intercultural communication. For example, we hear from students on foreign work placements, look at intercultural aspects of international sports events, ask how teachers can make use of intercultural exercises and simulations in their classroom and share with you any intercultural gossip we come across. ‘Absolutely Intercultural’ is not so much about passing on information but more about starting an intercultural dialogue between the makers, the contributors and the listeners. So, join in the conversation, the rest is just bits, bytes and RSS-feeds! This blog and podcast is collaboratively produced by a group of individuals. For questions about this blog and podcast, please contact Anne or Laurent at anne-laurent@absolutely-intercultural.com . 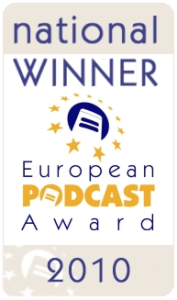 Although we give our time freely, running and hosting a podcast since 2006 inevitably incurs costs which include webhosting, site protection and maintenance, domain name registration and recording equipment. Up until now this has been covered by the owners and we now want to make the podcast more self-financing. However, the aim is not to make money but only to cover the running costs. Read more about how we do this below. This blog and podcast accepts forms of advertising, sponsorship, paid insertions or other forms of compensation. This blog and podcast abides by word of mouth marketing standards. We believe in honesty of relationship, opinion and identity. The owners of this blog and podcast are not compensated to provide opinion on products, services, websites and various other topics. The views and opinions expressed on this blog are purely the blog owners. If we claim or appear to be experts on a certain topic or product or service area, we will only endorse products or services that we believe, based on our expertise, are worthy of such endorsement. Any product claim, statistic, quote or other representation about a product or service should be verified with the manufacturer or provider. This blog does not contain any content which might present a conflict of interest. Nevertheless we would like to disclose the following relationships.